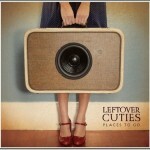 Leftover Cuties embody all of that goodness on their debut album Places To Go. Produced by Tony Berg (Bob Dylan, Michael Penn, Jesca Hoop), the eleven breezy, sophisticated songs evoke a magic-hour stroll on the beach with a special someone. With a newly defined musical direction, the duo dubbed themselves Leftover Cuties (more enigmatic and distinctive than Old Clementines, and sweeter). Stuart Johnson (drums), Ryan Feves (bass), and Mike Bolger (keys, horns, and accordion) came on board to flesh out the sound, and the band was off and running. In 2010, that sweet tune written on a napkin in five minutes was tabbed as the theme song for the acclaimed Showtime series “The Big C” starring Laura Linney.